A former cattle ranch, this state park boasts a bird checklist of more than 150 species. The park offers over 12 miles of beautiful, multi-use trails which make for great birding, wildlife viewing, horse-back riding, hiking and biking opportunities. These trails meander through the pine flatwoods around cypress domes, bottomland forest and past open pastures. Three tributaries flow through the park including Little Gator Creek, Gator Creek and the park’s namesake Colt Creek. While out on the trails you may come across some native wildlife including Bald Eagle, Eastern Bluebird, White-tailed Deer, Bobcat, River Otter and Sherman’s Fox Squirrel. Flatwoods contain Wild Turkey, Hairy Woodpecker, and Bachman’s Sparrow. 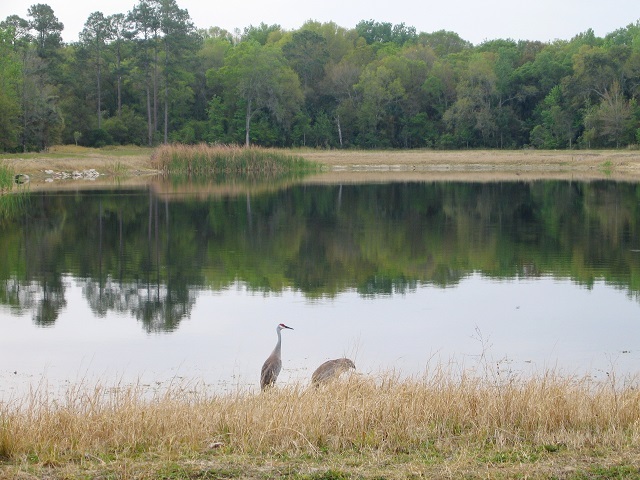 Check Mac Lake near the parking lot for Limpkin and Florida Sandhill Cranes. Swallow-tailed Kite (spring/summer), American Kestrel and Red-tailed Hawk are regularly seen. A number of interesting species have turned up here – American Pipit, Philadelphia Vireo, Golden-crowned Kinglet, Bobolink and Henslow’s Sparrow, plus more than 20 species of wood-warbler. Over 80 species of butterfly have been recorded including Pearl Crescent, Palamedes Swallowtail, Southern Skipperling and Dainty Sulphur. Primitive camp sites are available for organized youth groups.